Everyone has a different name for these cookies. It doesn’t really matter what you call them, truth be told, because these are always awesome. This year I added a little spice to my Mexican Wedding Cookies. I thought they could use a little Christmas cheer. Of course, you can always eliminate the spice and go with the more traditional flavors, it is up to you! Enjoy! 1. Preheat the oven to 325F. Line two baking sheets with silicone or silpat and set aside. 2. In a mixer or a large bowl cream together the butter and sugar. Then add the vanilla, cinnamon, cloves and salt and mix well. Add the flour and pecans and mix just until the batter forms. 3. 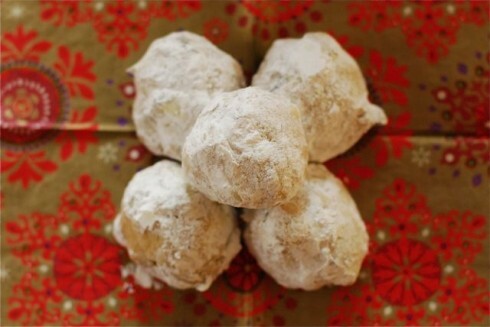 Roll the dough into large 1″ balls and place them 1″ apart on the cookie sheet. Bake for about 30 to 40 minutes, or until they are lightly tanned. 4. Allow the balls to cool completely and then roll them in a bowl of confectioners’ sugar to coat.